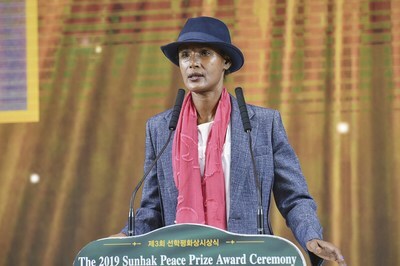 SEOUL, South Korea, Feb. 9, 2019 /PRNewswire/ — The Sunhak Peace Prize Committee held the 2019 Sunhak Peace Prize Award Ceremony on Feb. 9, 10 am, at Jamsil Lotte Hotel World. 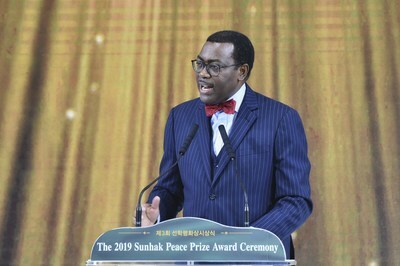 The Committee acknowledges Dr. Adesina’s achievements in improving Africa’s economy by promoting Good Governance and in leading agricultural innovation. His achievements contributed to food security in Africa, aimed at improving the lives of millions living in poverty in Africa. Waris asserted that FGM must be eradiated in our time and she will continue to fight for girls and women’s rights until we build a society where their rights can be respected. Chairman Hong asserted the importance of the vision One Family Under God, and the theme Human Rights and Human Development in Africa. 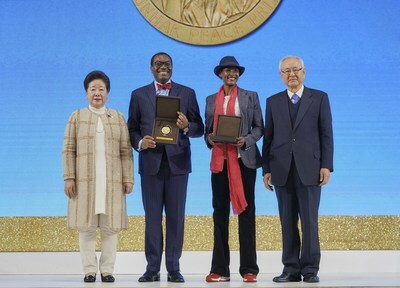 His Welcome Address emphasized that peace can be achieved only when everyone’s human rights are protected and how laureates’ devotion can bring humanity one step closer to opening a new chapter of world peace.